Nothing from nothing leaves nothing, and by that simple formula the premier dance company in Haiti survived the country’s devastating earthquake four years ago. Ayikodans, the acclaimed troupe founded by Port-au-Prince native Jeanguy Saintus, couldn’t lose what it never had. Performing-arts centers, wealthy benefactors, even costumes … those are the trappings of a different dance world, unfamiliar to most Haitian performers. 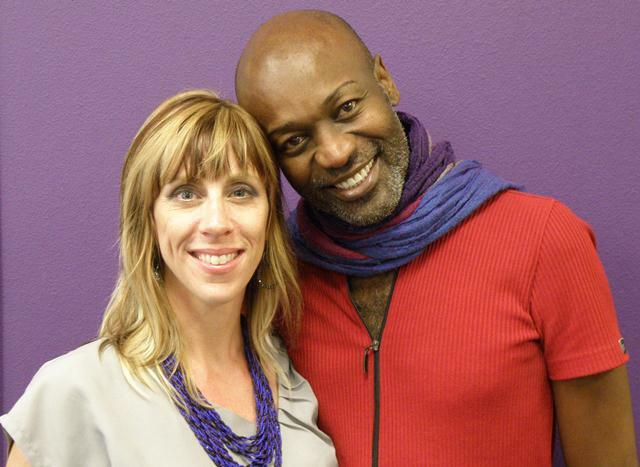 Susannah Keita, GCU’s director of dance, with Haitian choreographer Jeanguy Saintus. That hasn’t been sufficient to deter Saintus, who was raised by a single mother who died when he was a teenager and is now in his late 40s. When he started out as a dance teacher 25 years ago, families with a little money would pay for ballet lessons for their daughters. But few males were dancers, and choreographers weren’t serious about incorporating Haiti’s cultural heritage into their works. In 1998, Saintus established Dansepyenu (Dance Barefoot), a scholarship program, to offer free classes to poor children at his Artcho Danse school. Out of the school grew Ayikodans, a named derived from “Ayita” (a Haitian Creole word for Haiti) and “kontredanse” (a form of traditional dance from the country’s colonial past). The dance company, which currently has a dozen dancers, a half-dozen apprentices and eight percussionists, has performed sold-out shows to rave reviews in recent years in Miami, Fla. Two of its members accompanied Saintus to GCU, assisting him in what was a grueling week of classes for students in Susannah Keita’s dance program. Keita became acquainted with Saintus almost two years ago at an annual seminar in St. Louis on the Katherine Dunham method. She knew then that she wanted to bring him to Phoenix. In 2008, Saintus won the Prince Claus Award for cultural achievement from the Dutch government. One of his school’s graduates, an orphan named Vitolio Jeune, became a finalist on the TV show “So You Think You Can Dance” and went on to perform for a dance company in New York. Ayikodans has performed all over the world. However, Saintus doesn’t get much love at home. And because of the heartbreaking poverty there, talented dancers such as Jeune often leave the country, fleeing even to the neighboring Dominican Republic, where the arts enjoy much stronger support. “We don’t have a theatre — we perform in places,” Saintus said. “We don’t have funding. I have to fight and struggle. “I am always like this,” he said, placing his hand around his throat in a choking gesture. “I ask myself the same question every day,” he said, “and the only answer is that I’m crazy. The dancers themselves sometimes don’t understand the sacrifices that have been made to give them free training. A piece that Saintus choreographed during his residency will be performed by GCU students in the dance program’s spring concert, “reNEWal,” on April 22 and 23 at Ethington Theatre.